Gordon, William E; Kavanaugh, T.C. For more than 50 years, from its completion in 1963 until July 2016 when the Five hundred meter Aperture Spherical Telescope (FAST) in China was completed, the Arecibo Observatory's 1,000-foot (305-meter) radio telescope was the world's largest single-aperture telescope. It is used in three major areas of research: radio astronomy, atmospheric science, and radar astronomy. Scientists who want to use the observatory submit proposals that are evaluated by an independent scientific board. The observatory has appeared in film, gaming and television productions, gaining more recognition in 1999 when it began to collect data for the SETI@home project. It has been listed on the US National Register of Historic Places starting in 2008. It was the featured listing in the US National Park Service's weekly list of October 3, 2008. The center was named an IEEE Milestone in 2001. It has a visitor center that is open part-time. On September 21, 2017, high winds associated with Hurricane Maria caused the 430 MHz line feed to break and fall onto the primary dish, damaging about 30 out of 38,000 aluminum panels. Most Arecibo observations do not use the line feed but instead rely on the feeds and receivers located in the dome. Overall, the damage inflicted by Maria was minimal. The main collecting dish is 305 m (1,000 ft) in diameter, constructed inside the depression left by a karst sinkhole. The dish surface is made of 38,778 perforated aluminum panels, each about 3 by 6 feet (1 by 2 m), supported by a mesh of steel cables. The ground beneath is accessible and supports shade-tolerant vegetation. The observatory has four radar transmitters, with effective isotropic radiated powers of 20 TW (continuous) at 2380 MHz, 2.5 TW (pulse peak) at 430 MHz, 300 MW at 47 MHz, and 6 MW at 8 MHz. The reflector is a spherical reflector, not a parabolic reflector. To aim the device, the receiver is moved to intercept signals reflected from different directions by the spherical dish surface of 270 m (870 ft) radius. A parabolic mirror would have varying astigmatism when the receiver is off the focal point, but the error of a spherical mirror is uniform in every direction. The receiver is on a 900-ton platform suspended 150 m (492 ft) above the dish by 18 cables running from three reinforced concrete towers, one 111 m (365 ft) high and the other two 81 m (265 ft) high, placing their tops at the same elevation. The platform has a rotating, bow-shaped track 93 m (305 ft) long, called the azimuth arm, carrying the receiving antennas and secondary and tertiary reflectors. This allows the telescope to observe any region of the sky in a forty-degree cone of visibility about the local zenith (between −1 and 38 degrees of declination). Puerto Rico's location near the Northern Tropic allows Arecibo to view the planets in the Solar System over the Northern half of their orbit. The round trip light time to objects beyond Saturn is longer than the 2.6 hour time that the telescope can track a celestial position, preventing radar observations of more distant objects. A detailed view of the beam-steering mechanism and some antennas. The triangular platform at the top is fixed, and the azimuth arm rotates beneath it. To the left is the Gregorian sub-reflector, and to the right is the 96-foot-long (29 m) line feed tuned to 430 MHz. Just visible at the upper right is part of the rectangular waveguide that brings the 2.5 MW 430 MHz radar transmitter's signal up to the focal region. The origins of the observatory trace to late 1950s efforts to develop anti-ballistic missile (ABM) defences as part of the newly formed ARPA's ABM umbrella-effort, Project Defender. Even at this early stage it was clear that the use of radar decoys would be a serious problem at the long ranges needed to successfully attack a warhead, ranges on the order of 1,000 miles (1,600 km). Among the many Defender projects were several studies based on the concept that a re-entering nuclear warhead would cause unique physical signatures while still in the upper atmosphere. It was known that hot, high-speed objects caused ionization of the atmosphere that reflects radar waves, and it appeared that a warhead's signature would be different enough from decoys that a detector could pick out the warhead directly, or alternately, provide added information that would allow operators to focus a conventional tracking radar on the single return from the warhead. Although the concept appeared to offer a solution to the tracking problem, there was almost no information on either the physics of re-entry or a strong understanding of the normal composition of the upper layers of the ionosphere. ARPA began to address both simultaneously. To better understand the radar returns from a warhead, several radars were built on Kwajalein Atoll, while Arecibo started with the dual purpose of understanding the ionosphere's F-layer while also producing a general-purpose scientific radio observatory. The observatory was built between mid-1960 and November 1963. William E. Gordon of Cornell University oversaw its design, who intended to use it to study the Earth's ionosphere. He was attracted to the sinkholes in the karst regions of Puerto Rico that offered perfect cavities for a very large dish. Originally, a fixed parabolic reflector was envisioned, pointing in a fixed direction with a 150 m (492 ft) tower to hold equipment at the focus. This design would have limited its use in other research areas, such as radar astronomy, radio astronomy and atmospheric science, which require the ability to point at different positions in the sky and track those positions for an extended time as Earth rotates. Ward Low of the Advanced Research Projects Agency (ARPA) pointed out this flaw and put Gordon in touch with the Air Force Cambridge Research Laboratory (AFCRL) in Boston, Massachusetts, where one group headed by Phil Blacksmith was working on spherical reflectors and another group was studying the propagation of radio waves in and through the upper atmosphere. Cornell University proposed the project to ARPA in mid-1958 and a contract was signed between the AFCRL and the University in November 1959. Cornell University and Zachary Sears published a request for proposals (RFP) asking for a design to support a feed moving along a spherical surface 435 feet (133 m) above the stationary reflector. The RFP suggested a tripod or a tower in the center to support the feed. On the day the project for the design and construction of the antenna was announced at Cornell University, Gordon had also envisioned a 435 ft (133 m) tower centered in the 1,000 ft (305 m) reflector to support the feed. George Doundoulakis, who directed research at General Bronze Corporation in Garden City, New York, along with Zachary Sears, who directed Internal Design at Digital B & E Corporation, New York, received the RFP from Cornell University for the antenna design and studied the idea of suspending the feed with his brother, Helias Doundoulakis, a civil engineer. George Doundoulakis identified the problem that a tower or tripod would have presented around the center, (the most important area of the reflector), and devised a better design by suspending the feed. He presented his proposal to Cornell University for a doughnut or torus-type truss suspended by four cables from four towers above the reflector, having along its edge a rail track for the azimuthal truss positioning. This second truss, in the form of an arc, or arch, was to be suspended below, which would rotate on the rails through 360 degrees. The arc also had rails on which the unit supporting the feed would move for the feed's elevational positioning. A counterweight would move symmetrically opposite to the feed for stability and, if a hurricane struck, the whole feed could be raised and lowered. Helias Doundoulakis designed the cable suspension system which was finally adopted. Although the present configuration is substantially the same as the original drawings by George and Helias Doundoulakis, (although with three towers, instead of the original four as drawn in the original patent), the U.S. Patent office granted Helias Doundoulakis a patent, for the brothers' innovative idea. Two other assignees on the patent were friends William J. Casey, who later became director of the Central Intelligence Agency under President Ronald Reagan, and Constantine Michalos, an attorney. The idea of a spherical reflecting mirror with a steerable secondary has since been used in optical telescopes, in particular, the Hobby–Eberly Telescope and the Southern African Large Telescope. Construction began in mid-1960, with the official opening on November 1, 1963. As the primary dish is spherical, its focus is along a line rather than at one point, as would be the case for a parabolic reflector. As a result, complex line feeds were implemented to carry out observations. Each line feed covered a narrow frequency band: 2–5% of the center frequency of the band. A limited number of line feeds could be used at any one time, limiting the telescope's flexibility. Since then, the telescope has been upgraded several times. Initially, when the maximum expected operating frequency was about 500 MHz, the surface consisted of half-inch galvanized wire mesh laid directly on the support cables. In 1974, a high-precision surface consisting of 40,000 individually adjustable aluminum panels replaced the old wire mesh, and the highest usable frequency rose to about 5000 MHz. A Gregorian reflector system was installed in 1997, incorporating secondary and tertiary reflectors to focus radio waves at one point. This allowed installing a suite of receivers, covering the full 1–10 GHz range, that could be easily moved to the focal point, giving Arecibo more flexibility. A metal mesh screen was also installed around the perimeter to block the ground's thermal radiation from reaching the feed antennas. Finally, a more powerful 2400 MHz transmitter was added. The Arecibo message with added color to highlight the separate parts. The actual binary transmission carried no color information. Many scientific discoveries have been made with the observatory. On April 7, 1964, soon after it began operating, Gordon Pettengill's team used it to determine that the rotation period of Mercury was not 88 days, as formerly thought, but only 59 days. In 1968, the discovery of the periodicity of the Crab Pulsar (33 milliseconds) by Lovelace and others provided the first solid evidence that neutron stars exist. In 1974, Hulse and Taylor discovered the first binary pulsar PSR B1913+16, an accomplishment for which they later received the Nobel Prize in Physics. In 1982, the first millisecond pulsar, PSR B1937+21, was discovered by Donald C. Backer, Shrinivas Kulkarni, Carl Heiles, Michael Davis, and Miller Goss. This object spins 642 times per second and, until the discovery of PSR J1748-2446ad in 2005, was identified as the fastest-spinning pulsar. In August 1989, the observatory directly imaged an asteroid for the first time in history: 4769 Castalia. The following year, Polish astronomer Aleksander Wolszczan made the discovery of pulsar PSR B1257+12, which later led him to discover its three orbiting planets. These were the first extrasolar planets discovered. In 1994, John Harmon used the Arecibo Radio Telescope to map the distribution of ice in the polar regions of Mercury. In January 2008, detection of prebiotic molecules methanimine and hydrogen cyanide were reported from the observatory's radio spectroscopy measurements of the distant starburst galaxy Arp 220. From January 2010 to February 2011, American astronomers Matthew Route and Aleksander Wolszczan detected bursts of radio emission from the T6.5 brown dwarf 2MASS J10475385+2124234. This was the first time that radio emission had been detected from a T dwarf, which has methane absorption lines in its atmosphere. It is also the coolest brown dwarf (at a temperature of ~900K) from which radio emission has been observed. The highly polarized and highly energetic radio bursts indicated that the object has a >1.7 kG-strength magnetic field and magnetic activity similar to both the planet Jupiter and the Sun. In 1974, the Arecibo Message, an attempt to communicate with potential extraterrestrial life, was transmitted from the radio telescope toward the globular cluster Messier 13, about 25,000 light-years away. The 1,679 bit pattern of 1s and 0s defined a 23 by 73 pixel bitmap image that included numbers, stick figures, chemical formulas and a crude image of the telescope. Search for Extra-Terrestrial Intelligence (SETI) is the search for extraterrestrial life or advanced technologies. SETI aims to answer the question "Are we alone in the Universe?" by scanning the skies for transmissions from intelligent civilizations elsewhere in our galaxy. In comparison, METI (Messaging to Extra-Terrestrial Intelligence) refers to the active search by transmitting messages. Arecibo is the source of data for the SETI@home and Astropulse distributed computing projects put forward by the Space Sciences Laboratory at the University of California, Berkeley and was used for the SETI Institute's Project Phoenix observations. The Einstein@Home distributed computing project has found more than 20 pulsars in Arecibo data. 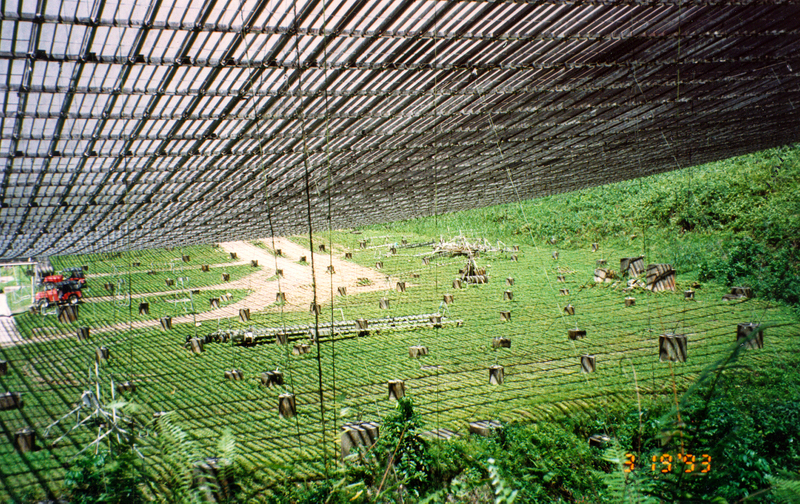 Terrestrial aeronomy experiments at Arecibo have included the Coqui 2 experiment, supported by NASA. The telescope also has military intelligence uses, some of which include locating Soviet radar installations by detecting their signals bouncing off the Moon. Limited amateur radio operations have occurred, using moon bounce or Earth–Moon–Earth communication, in which radio signals aimed at the Moon are reflected back to Earth. The first of these operations was on June 13–14, 1964, using the call KP4BPZ. A dozen or so two-way contacts were made on 144 and 432 MHz. On July 3 and July 24, 1965, KP4BPZ was again activated on 432 MHz, making approximately 30 contacts on 432 MHz during the limited time slots available. For these tests, a very wide-band instrumentation recorder captured a large segment of the receiving bandwidth, enabling later verification of other amateur station callsigns. These were not two-way contacts. From April 16–18, 2010, again, the Arecibo Amateur Radio Club KP4AO conducted moon-bounce activity using the antenna. On November 10, 2013, the KP4AO Arecibo Amateur Radio Club conducted a Fifty-Year Commemoration Activation, lasting 7 hours on 14.250 MHz SSB, without using the main dish antenna. Since the early 1970s, the Arecibo Observatory has been supported by the NSF (National Science Foundation divisions of Astronomical Sciences and of Atmospheric Sciences) with incremental support by NASA, for operating the planetary radar. Between 2001 and 2006, NASA decreased, then eliminated, its support of the planetary radar, but restored and increased the funding in FY-2010. A report by the NSF division of Astronomical Sciences, made public on November 3, 2006, recommended substantially decreased astronomy funding for the Arecibo Observatory, from $10.5 million in 2007 to $4.0 million in 2011. If other sources of money could not be obtained, the observatory would be forced to close. The report also advised that 80 percent of observing time be allocated to the surveys already in progress, reducing available time for smaller programs. Academics and researchers responded by organizing to protect and advocate for the observatory. They established the Arecibo Science Advocacy Partnership (ASAP), to advance the scientific excellence of Arecibo Observatory research and to publicize its accomplishments in astronomy, aeronomy and planetary radar. ASAP's goals included mobilizing the existing broad base of support for Arecibo science within the fields it serves directly, the broad scientific community; provide a forum for the Arecibo research community and enhance communication within it; promote the potential of Arecibo for groundbreaking science; suggest paths that will maximize it into the foreseeable future, and showcase the broad impact and far-reaching implications of the science currently carried out with this unique instrument. Contributions by the government of Puerto Rico may be one way to help fill the funding gap, but remain controversial and uncertain. At town hall meetings about the potential closure, Puerto Rican Senate President Kenneth McClintock announced an initial local appropriation of $3.0 million during fiscal year 2008 to fund a major maintenance project to restore the three pillars that support the antenna platform to their original condition, pending inclusion in the next bond issue. The bond authorization, with a $3.0 million appropriation, was approved by the Senate of Puerto Rico on November 14, 2007, on the first day of a special session called by Aníbal Acevedo Vilá. The Puerto Rico House of Representatives repeated this action on June 30, 2008. Puerto Rico's governor signed the measure into law in August 2008. These funds were made available during the second half of 2009. In a letter published on September 19, 2007, José Enrique Serrano, a member of the U.S. House of Representatives Appropriations Committee, asked the National Science Foundation to keep Arecibo operating. Language similar to that of the letter of September 19 was included in the FY-2008 omnibus spending bill. In October 2007, Puerto Rico's then-Resident Commissioner, Luis Fortuño, along with Dana Rohrabacher, filed legislation to assure the continued operation of the famed observatory. A similar bill was filed in the U.S. Senate in April 2008 by the Junior Senator from New York, Hillary Clinton. In September 2007, in an open letter to researchers, the NSF clarified the status of the budget for NAIC, stating the present plan could hit the targeted budgetary revision. No mention of private funding was made. However, in the event that its budget target is not reached, it must be noted that the NSF is undertaking studies to mothball or demolish the observatory to return it to its natural setting. In November 2007, The Planetary Society urged the U.S. Congress to prevent the Arecibo Observatory from closing because of insufficient funding, since its radar contributes greatly to the accuracy of predictions of asteroid impacts on the Earth. The Planetary Society believes that continued operation of the observatory will reduce the cost of mitigation (that is, deflection of a near-Earth asteroid on collision to Earth), should that be necessary. Also in November of that year The New York Times described the consequences of the budget cuts at the site. In July 2008, the British newspaper The Daily Telegraph reported that the funding crisis, due to federal budget cuts, was still very much alive. The SETI@home program is using the telescope as a primary source for ET research. The program urges people to send a letter to their political representatives in support of full federal funding of the observatory. The NAIC received $3.1 million from the American Recovery and Reinvestment Act of 2009. This was used for basic maintenance and for a second, much smaller, antenna to be used for very long baseline interferometry, new Klystron amplifiers for the planetary radar system and student training. This allotment was an increase of about 30 percent over the FY-2009 budget. However, the FY-2010 funding request by NSF was cut by $1.2 million (−12.5%) over the FY-2009 budget, in light of their continued plans to reduce funding. The 2011 NSF budget was reduced by a further $1.6 million, −15% compared to 2010, with a further $1.0 million reduction projected by FY-2014. Starting in FY-2010, NASA restored its historical support by contributing $2.0 million per year for planetary science, particularly the study of near-Earth objects, at Arecibo. NASA implemented this funding through its Near Earth Object Observations program. NASA increased its support to $3.5 million per year in 2012. Furthermore, in 2010 the NSF issued a call for new proposals for the management of NAIC starting in FY-2012. On May 12, 2011, the agency informed Cornell University that, as of October 1, 2011, it would no longer be the operator of the NAIC and the Arecibo Observatory. At that time, Cornell transferred its operations to SRI International, along with two other managing partners, Universities Space Research Association and Universidad Metropolitana de Puerto Rico, with a number of other collaborators. Upon the award of the new cooperative agreement for NAIC management and operation, NSF also decertified NAIC as a Federally Funded Research and Development Center (FFRDC), with the stated goal of providing the NAIC with greater freedom to establish broader scientific partnerships and pursue funding opportunities for activities beyond the scope of those supported by NSF. In October 2015, the NSF released a "Dear Colleague Letter" reiterating its desire for a "substantially reduced funding commitment from NSF". On September 30, 2016, the NSF released a followup to the October 2015 "Dear Colleague Letter" announcing a solicitation for future operation of the Observatory stating "The subject Solicitation will request the submission of formal proposals involving the continued operation of Arecibo Observatory under conditions of a substantially reduced funding commitment from NSF." The damage sustained from Hurricane Maria in September 2017 further clouded the observatory's future. Although the damage was minimal, restoring all the previous capabilities required more than the observatory's already-threatened operating budget, and users feared the decision would be made to decommission it instead. However, it was announced in February 2018 that a consortium led by the University of Central Florida will allow the NSF to reduce its contribution towards Arecibo's operating costs from $8 million to $2 million from the fiscal year 2022–2023, with the shortfall made up by the consortium partners, thus securing the observatory's future. Opened in 1997, the Ángel Ramos Foundation Visitor Center features interactive exhibits and displays about the operations of the radio telescope, astronomy and atmospheric sciences. The center is named after the financial foundation that honors Ángel Ramos, owner of the El Mundo newspaper and founder of Telemundo. The Foundation provided half of the funds to build the Visitor Center, with the remainder received from private donations and Cornell University. The center, in collaboration with the Caribbean Astronomical Society, host a series of Astronomical Nights throughout the year, which feature diverse discussions regarding exoplanets, and astronomical phenomena and discoveries (such as Comet ISON). The main purpose of the center is to increase public interest in astronomy, the observatory's research successes, and space endeavors. 1973–1982, Harold D. Craft Jr.
Due to its unique shape and concept the observatory is featured in many movies, video games and novels. The observatory was featured on Cosmos: A Personal Voyage in part 12, "Encyclopedia Galactica". The observatory was stolen by Robocrook in episode 24 (The Radioscope Rip-Off)/Season1 of the Where in the World is Carmen Sandiego? animated series from PBS. The observatory was used as a filming location in the climax of the James Bond movie GoldenEye (1995), and as a level in the accompanying Nintendo 64 video game GoldenEye 007; both depict the location as a secret antenna cradle in Cuba that is used to control the titular GoldenEye satellites. The film Contact (1997), based on the Carl Sagan 1985 novel of the same name, features the main character using the observatory as part of a SETI project. Fox Mulder went to the observatory in The X-Files episode, "Little Green Men". The observatory is featured in the film Species (1995). The observatory is featured in the James Gunn novel The Listeners (1972), the Robert J. Sawyer novel Rollback and the Mary Doria Russell novel The Sparrow (1996). A radio telescope based on the observatory is featured in the videogame Just Cause 2. Although never specifically named, the first lines of the Arthur C. Clarke novel 2010: Odyssey Two strongly imply that the opening scene takes place at the observatory. However, for the 1984 film adaptation, this scene was filmed at the Very Large Array in New Mexico. The Battlefield 4 multiplayer map, Rogue Transmission, is inspired by the observatory. The (2010) movie of The Losers has one scene filmed in the observatory. Jimmy Buffett's novel Where Is Joe Merchant? includes a character named Desdemona who once worked at the observatory, where she began receiving telepathic messages from outer space. Buffett also wrote a song about her, called "Desdemona's Building A Rocket Ship". In the game Supertuxkart there is a level called Alien Signal featuring a giant telescope in a natural sinkhole inspired by the observatory. The image used for Joy Division's Unknown Pleasures album cover, was originally created by radio astronomer Harold Craft at the Arecibo Observatory for his 1970 PhD thesis. Tor Hagfors, former director of the observatory (1971–1973) and also of NAIC (October 1982 to September 1992). ^ "Radio-Radar Telescope Will Probe Solar System". Electrical Engineering. 80 (7): 561. July 1961. doi:10.1109/EE.1961.6433355. Retrieved 2016-07-31. ^ a b National Park Service (October 3, 2008). "Weekly List Actions". Retrieved February 6, 2018. ^ "Iconic Arecibo radio telescope saved by university consortium". Science. February 22, 2018. Archived from the original on March 4, 2018. Retrieved March 3, 2018. ^ "UCF-led Consortium to Manage Arecibo Observatory in Puerto Rico" (Press release). UCF Today. 2018-02-22. ^ a b "NSF request for proposals issued in 2010" (PDF). Retrieved September 2, 2011. ^ "Weekly List Actions". National Park Service. Archived from the original on December 2, 2009. Retrieved October 21, 2009. ^ "Milestones:NAIC/Arecibo Radiotelescope, 1963". IEEE Global History Network. IEEE. Retrieved July 29, 2011. ^ Kaplan, Sarah (September 22, 2017). "Arecibo Observatory, Puerto Rico's famous telescope, is battered by Hurricane Maria". The Washington Post. ^ Drake, Nadia (September 22, 2017). "Hurricane Damages Giant Radio Telescope—Why It Matters". National Geographic. ^ a b Foust, Jeff (September 27, 2017). "Damage to Arecibo less than feared". SpaceNews. Retrieved February 5, 2018. ^ a b "Good news, earthlings! Puerto Rico telescope still guarding the galaxy despite Maria". Miami Herald. 2017-10-23. ^ David Brand (21 January 2003). "Astrophysicist Robert Brown, leader in telescope development, named to head NAIC and its main facility, Arecibo Observatory". Cornell University. Retrieved 2008-09-02. ^ "General Views of the Arecibo Observatory". Image Gallery. Arecibo Observatory. Retrieved 25 August 2013. ^ Cohen, M. H. (2009). "Genesis of the 1000-foot Arecibo dish". Journal of Astronomical History and Heritage. 12 (2): 141. Bibcode:2009JAHH...12..141C. ^ a b c "Defender Anti-Ballistic Missile", DARPA Technical Accomplishments Volume II: A Historical Review Of Selected DARPA Projects, April 1991, Section I: PRESS. ^ "IEEE History Center: NAIC/Arecibo Radiotelescope, 1963". Institute of Electrical and Electronics Engineers. Retrieved 2008-09-02. ^ "Pictures of the construction of Arecibo Observatory (start to finish)". National Astronomy and Ionosphere Center. Archived from the original on May 5, 2009. Retrieved 2009-05-05. ^ "Description of Engineering of Arecibo Observatory". Acevedo, Tony (June 2004). Archived from the original on May 4, 2009. Retrieved May 5, 2009. ^ "Arecibo Observatory". History.com. Archived from the original on March 14, 2009. Retrieved 2008-09-02. ^ Dyce, R. B.; Pettengill, G. H.; Shapiro, I. I. (April 1967). "Radar determination of the rotations of Venus and Mercury". Astron. J. 72 (3): 351–359. Bibcode:1967AJ.....72..351D. doi:10.1086/110231. ^ Richard V.E. Lovelace. "Discovery of the Period of the Crab Nebula Pulsar" (PDF). Cornell University. Archived from the original (PDF) on September 12, 2008. Retrieved September 2, 2008. ^ Hulse, R.A. & Taylor, J.H. (1975). "Discovery of a pulsar in a binary system". The Astrophysical Journal. 195: L51–L53. Bibcode:1975ApJ...195L..51H. doi:10.1086/181708. ^ D. Backer; et al. (1982). "A millisecond pulsar". Nature. 300 (5893): 315–318. Bibcode:1982Natur.300..615B. doi:10.1038/300615a0. ^ "Asteroid 4769 Castalia (1989 PB)". NASA. Archived from the original on September 16, 2008. Retrieved 2008-09-02. ^ Wolszczan, A. (1994). Confirmation of Earth Mass Planets Orbiting the Millisecond Pulsar PSR: B1257+12. Science. p. 538. ^ Harmon, J.K.; M.A. Slade; R.A. Velez; A. Crespo; M.J. Dryer & J.M. Johnson (1994). Radar Mapping of Mercury's Polar Anomalies. Nature. p. 369. ^ Staff (15 January 2008). "Life's Ingredients Detected In Far Off Galaxy". ScienceDaily. ScienceDaily LLC. Archived from the original on April 21, 2008. Retrieved 2008-03-29. [Article] Adapted from materials provided by Cornell University. ^ Matthew Route & Aleksander Wolszczan (2012). "The Arecibo Detection of the Coolest Radio-flaring Brown Dwarf". The Astrophysical Journal Letters. 747 (2): L22–L25. arXiv:1202.1287. Bibcode:2012ApJ...747L..22R. doi:10.1088/2041-8205/747/2/L22. ^ Larry Klaes (November 30, 2005). "Making Contact". Ithaca Times. Archived from the original on December 5, 2008. Retrieved 2008-09-02. ^ Geaorge Cassiday. "The Arecibo Message". The University of Utah: Department of Physics. Archived from the original on January 17, 2010. Retrieved 2007-07-27. ^ Peter Backus (April 14, 2003). "Project Phoenix: SETI Prepares to Observe at Arecibo". Space.com. Archived from the original on December 4, 2008. Retrieved 2008-09-02. ^ "Einstein@Home new discoveries and detections of known pulsars in the BRP4 search". Einstein@Home. August 27, 2012. Retrieved August 28, 2012. ^ "ARRL; Moonbounce for everyone". Retrieved January 10, 2013. ^ Butrica, Andrew J. (1996). "NASA SP-4218: To See the Unseen – A History of Planetary Radar Astronomy". NASA. Archived from the original on November 1, 2007. Retrieved August 6, 2014. ^ Robert Roy Britt (20 December 2001). "NASA Trims Arecibo Budget, Says Other Organizations Should Support Asteroid Watch". Space.com. Imaginova. Archived from the original on December 5, 2008. Retrieved 2008-07-08. ^ Blandford, Roger (22 October 2006). "From the Ground Up: Balancing the NSF Astronomy Program" (PDF). National Science Foundation. Archived (PDF) from the original on June 26, 2008. Retrieved July 7, 2008. ^ Weiss, Rick Weiss (9 September 2007). "Radio Telescope And Its Budget Hang in the Balance". The Washington Post. Arecibo, Puerto Rico: The Washington Post Company. p. A01. Retrieved July 8, 2008. The cash crunch stems from an NSF senior review completed last November. Its $200 million astronomy division, increasingly committed to ambitious new projects, but long hobbled by flat Congressional budgets, was facing a deficit of at least $30 million by 2010. ^ a b "Areciboscience.org". Areciboscience.org. Retrieved May 11, 2012. ^ "Senado aprueba emisión de bonos de $450 millones" (in Spanish). Primera Hora. November 14, 2007. Archived from the original on December 8, 2008. Retrieved September 4, 2008. ^ Gerardo, E.; Alvarado, León (August 10, 2008). Gobernador firma emisión de bonos. El Nuevo Día. ^ Serrano, José E. (September 19, 2007). "Serrano concerned about potential Arecibo closure". serrano.house.gov. Archived from the original on July 30, 2008. Retrieved 2008-09-04. ^ "Congress gets bill to save Arecibo Observatory". Cornell University. 3 October 2007. Archived from the original on October 8, 2007. Retrieved September 4, 2008. ^ Jeannette Rivera-lyles (April 25, 2008). "Clinton turns attention to observatory in Puerto Rico". Orlando Sentinel. Archived from the original on September 30, 2008. Retrieved September 4, 2008. ^ "Dear Colleague Letter: Providing Progress Update on Senior Review Recommendations" (Press release). The National Science Foundation. September 20, 2007. Archived from the original on June 28, 2008. Retrieved July 9, 2008. ^ Arecibo participated in 90 of the 111 asteroid radar observations in 2005–2007. See JPL's list of all asteroid radar observations. ^ "12-m Phase Reference Antenna". Naic.edu. June 28, 2010. Archived from the original on March 15, 2012. Retrieved May 11, 2012. ^ "SRI International to Manage Arecibo Observatory" (Press release). SRI International. 2013-07-10. Retrieved 2013-07-10. ^ "SRI International to manage Arecibo Observatory". Cornell Chronicle. June 3, 2011. Retrieved January 11, 2012. ^ "Dear Colleague Letter: Concepts for Future Operation of the Arecibo Observatory". 26 October 2015. Retrieved November 11, 2015. ^ "Dear Colleague Letter: Intent to Release a Solicitation Regarding Future Continued Operations of the Arecibo Observatory". September 30, 2016. Retrieved October 2, 2016. ^ Clery, Daniel (September 26, 2017). "Hurricane damage threatens Arecibo Observatory's future". Science. doi:10.1126/science.aaq0598. (Subscription required (help)). ^ Clery, Daniel (March 2, 2018). "Arecibo telescope saved by university consortium". Science. 359 (6379): 965–966. Bibcode:2018Sci...359..965C. doi:10.1126/science.359.6379.965. PMID 29496850. (Subscription required (help)). ^ "Sociedad de Astronomia del Caribe". www.sociedadastronomia.com. ^ "3,273,156 (1966-09-13) Helias Doundoulakis, Radio Telescope having a scanning feed supported by a cable suspension over a stationary reflector". U.S. Patent Office. Friedlander, Blaine P. Jr. (November 14, 1997). "Research rockets, including an experiment from Cornell, are scheduled for launch into the ionosphere next year from Puerto Rico". Cornell University. Archived from the original on November 19, 2005. Ruiz, Carmelo (1998-03-03). "Activists protest US Navy radar project". Global Network Against Weapons and Nuclear Power in Space. Archived from the original on 2001-05-01. Amir Alexander (July 3, 2008). "Budget Cuts Threaten Arecibo Observatory". The Planetary Society. Archived from the original on July 21, 2008. Blaine Friedlander (June 10, 2008). "Arecibo joins global network to create 6,000-mile (9,700 km) telescope". EurekAlert. Lauren Gold (June 5, 2008). "Clintons (minus Hillary) visit Arecibo; former president urges more federal funding for basic sciences". Cornell university. Henry Fountain (December 25, 2007). "Arecibo Radio Telescope Is Back in Business After 6-Month Spruce-Up". New York Times. Cohen, Marshall H. (2009). "Genesis of the 1000-foot Arecibo Dish". Journal of Astronomical History and Heritage. 12: 141–152. Bibcode:2009JAHH...12..141C. Altschuler, Daniel R.; Salter, Christopher J. (2013). "The Arecibo Observatory: Fifty astronomical years". Physics Today. 66 (11): 43. Bibcode:2013PhT....66k..43A. doi:10.1063/PT.3.2179. Wikimedia Commons has media related to Arecibo Observatory.